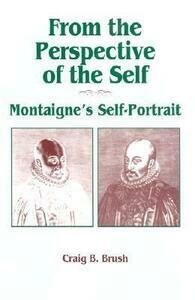 In 1580 Michel de Montaigne (1533-1592) presented a literary project to the public the type of wich had never before been introduced- a collection of Essays with himself as subject. Never before had a writer attempted a literary self-portrait, and in so doing Montaigne named and defined a new literary form, the essay. Brush's critical study of Essays examines the complex process of writing a self-portrait and showing the ways in which it is an entirely differnt enterprise from writing an autobiography. The author discusses how Montaigne revealed his "mind in motion," and the most remarkable feature of that mind, skepticism. He treats Montaigne's development of a conversational voice and explicates how Montaigne's intense self-examination became an evolutionary process which had consequences in his life and literature. The work concludes with a discussion of how Montaigne's self-assigned task of introspection included the formulation of a view of humanity and its ethics. Brush's work fills a gap in scholarship by critically examining the essential loci of the Essays, namely, the creation of a literary self-portrait. The book makes its points convincingly because of Brush's intimacy and command of the essays. Montaigne's works are cited in English translation, and the subject is presented in terms accessible to the non-specialist.